One of my Missions this week is to remove 1 non-essential app from my smart phone. Tonight I removed 4 non-essential apps from my phone. I was thinking about removing some of these apps last week, but didn't accomplish doing so. 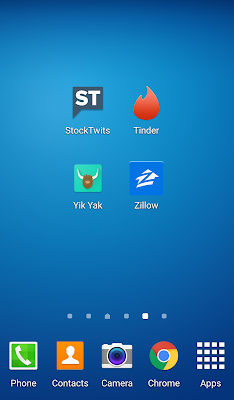 The 4 apps I removed are StockTwits, Tinder, Yik Yak, and Zillow. I had actually uninstalled Yik Yak around two weeks ago, but ended up reinstalling it. StockTwits - I'm not 100% sure how to explain it, but users could post about stocks and say if they were Bullish or Bearish on stocks. I think I was expecting to follow some trusting and intelligent stock guru and follow his advice. I used it for about 2 days and stopped using it. Tinder - This is a hook-up/dating/fling app. I am in a college town, so there were a lot of women using this app, but I had little luck of finding a match. I was getting irritated I was getting any matches. Maybe with some more weight loss, I could improve my chances, but for now, I'm uninstalling the app. Plus, I still believe in the magic of meeting someone in person. Yik Yak - This is an app where people can post anonymous 200 character posts. People who are geographically close to you can see those posts. These posts can be up-voted and down-voted. Again, with being in a college town, this was filled with a lot of garbage posts. "Netflix and Chill?" was a very popular statement. It was a good way to kill time, and to sort of see what was going on nearby, but not enough for me to keep it installed. Zillow - This is a real estate app to view houses for sale. I do not plan on buying a house again for a long, long time. Knowing this, I will not need this app.